The Eleventh Hour is a great and adventurous alpine climb located up high in the heart of the Wasatch range. It has a relatively long approach (but it is a very nice and enjoyable hike), and offers great climbing in an amazing alpine setting, with killer exposure and cool mountain views. Get an early start as this is a fairly long day for most parties, and avoid afternoon thunderstorms. There are a few loose sections on this route, but the rock (quartzite) is generally very solid. The route is sustained in nature, and spicy for the grade, with consistent sections of 5.7, and a few 5.8 moves. There are also possibilities for 5.9 variations to the left of the route. Protection on quartzite can be tricky to place, and is sparse in some sections (especially on the first pitch) so don’t pass a good placement opportunity! The Lake Blanche area below the Sundial Peak is also a great place to go camping the night before your climb, and fishing in the beautiful high alpine lakes is possible. Great hiking trails, lakes, peaks and ridges are easily accessible from here. Please stay on trail and don’t step on the fragile vegetation. The climb is located high up Big Cottonwood Canyon, and the route starts at around 8000’. Beware of fast moving afternoon thunderstorms and dress appropriately. In early season, the last part of the trail leading up to the route might be covered with snow, and some sections of the route might still be wet. This is the perfect route to do on a hot summer day, when the temps are over 100 degrees in the Salt Lake Valley. Our GearLoopTopo for Eleventh Hour contains all the information you need for the climb, starting from Big Cottonwood Canyon in Salt Lake City. There are a couple more routes located on Sundial Peak, but they are of lower quality. Also, because of the lenght of the approach and descent, simply climbing the Eleventh Hour is usually an all day affair. But if you climb very fast and are looking to add a few more pitches to your day, consider stopping at the Millstone Wall, which is a southeast facing wall located on the west side of the Lake Blanche trail. This face has many great, steep, mostly bolted routes and gets shade in the afternoon. Another option is to climb at the S-Curve area, just across the road from the parking lot. 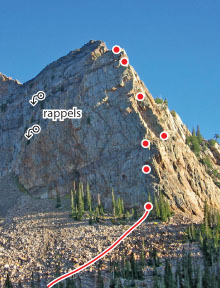 For other great alpine routes in the Wasatch, but with a shorther approach and on a different type of rock, simply head up to Alta and climb the Black Streak (5.10b) or Horns of Satan (5.10b). If you want to go for a big hike and escape the city, head up to Lone Peak Cirque and try The Open Book (5.7) or Center Thumb (5.9). Download the Eleventh Hour PDF file or visit the PDF Center.